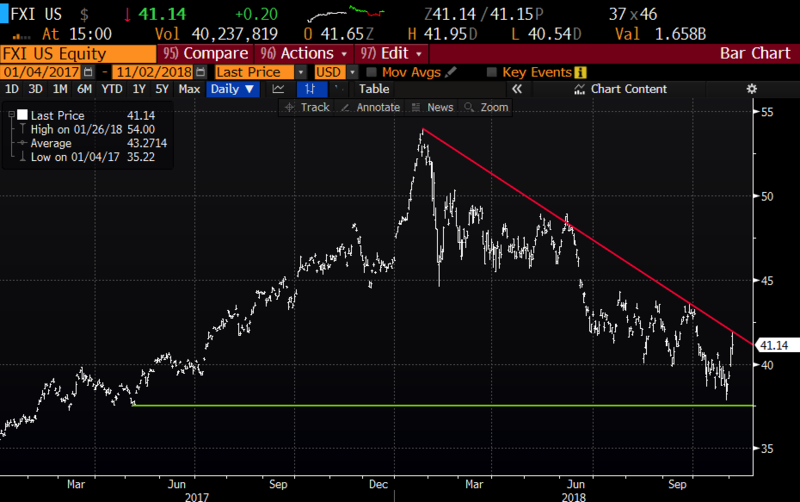 FXI – Yuan a Trade War? If we are measuring the winners and losers of the brewing trade skirmish with China in terms of stock market returns in 2018, then China has so far clearly been the loser with the Shanghai Composite down 19% on the year, and down 25% from its 52-week highs made in January. Which despite the S&P 500’s (SPX) 8% decline in just the last month, it is still up 1% on the year. 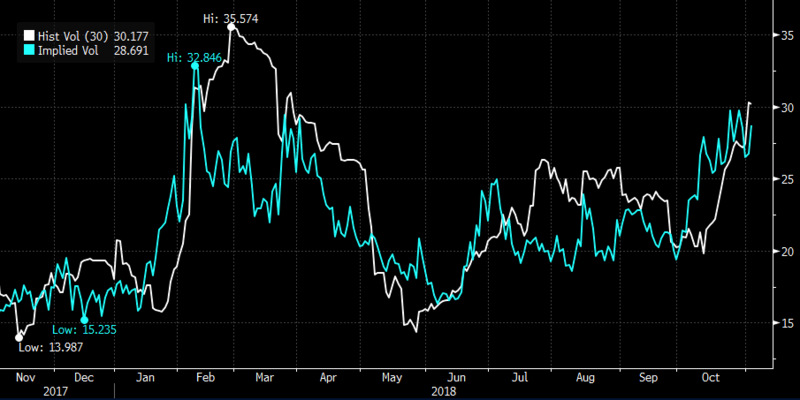 In just the last twenty-four hours, both the Shanghai Comp and the SPX have seen volatility based on rumors and commentary about a trade deal. Overnight the Shanghai ripped, closing up 2.7% on a Bloomberg report that Trump had asked his cabinet to draw up a potential trade deal. This wreaked of a cheap political stunt at best days before the midterms next week. What’s become clear from reporting from CNBC’s Eamon Javers prior to the SPX open, and comments this afternoon before 1pm from the President’s National Economic Advisor, Larry Kudlow on CNBC, there will be no meaningful break-through on trade until at least month-end when Trump and China’s President XI meet at the G-20 in Argentina. And then, and likely not the final comment for the day, Trumpp told reporters around 2;30 pm “he thinks the U.S. will reach a trade deal with China”, causing equity markets to rally. But again only suggesting that the two presidents will have dinner together at the G-20 in late November. A narrative that’s captured traders’ attention in recent weeks has been a “consumption downgrade” in the world’s second-biggest economy. …Investors aren’t the only ones worried about China’s consumers. Authorities are taking steps to shore up spending — all the more so with trade tensions sending manufacturing gauges to the weakest levels since the economy’s 2015-2016 hard-landing scare. A slowing auto market has been one major reason for the deceleration in retail sales this year, and China’s top economic planning body is proposing to halve the tax on car purchases to 5 percent, Bloomberg News has reported. Personal income-tax cuts are also on the table. The iShares Large Cap China etf is heavily weighted towards banks, but interestingly the second largest holding is Tencent, the massive internet conglomerate that was up nearly 10% overnight. So what’s the trade? I suspect the Chinese are not likely to consider any trade concessions until they get a sense for the sort of footing Trump is on after the mid-terms next week. If he comes out weaker than I suspect the Chinese will take their time. If he comes out stronger Trump may play a little hardball. Either way, I would not expect a quick resolution, more saber-rattling and possibly more stock market volatility, with China bearing the brunt at least initially. Short-dated options prices are not cheap, with 30-day at the money implied volatility (blue line below) nearing 30% just below the 52-week highs made in February, but relative to realized volatility (how much the stock has been moving, the white line below) options prices look fair. Profits of up to 1.40 between 40.40 and 39 with max gain of 1.40 at 39 or lower. Rationale: this trade idea risks 1.5% of the etf price, offering a break-even down 1.8% with the potential to make nearly 2.2x the premium at risk over the next two weeks.